Can’t find a workshop to fit your schedule? Contact us at training@bigladdersoftware.com to request a quote for an in-house workshop. Sign up for our newsletter to receive notifications of future training offerings. Still need help after the training? We also provide EnergyPlus and OpenStudio support services. We offer in-person public and private (in-house or webinar) EnergyPlus training workshops. We have trained hundreds of new users in the intricacies of EnergyPlus in workshops at US and international locations. We offer public and private OpenStudio training workshops. We are licensed through the National Renewable Energy Laboratory as official training providers for OpenStudio. We offer public and private DesignBuilder training workshops. We are authorized through DesignBuilder Software (UK) as the official training providers for DesignBuilder in the US. We offer public and private California Simulation Engine training workshops, where we teach CBECC-Res users about the intricacies of the input file that the underlying simulation engine (California Simulation Engine) uses for residential building design and compliance evaluation. Contact us at training@bigladdersoftware.com for more information, or to request a quote for an in-house workshop. We are a team of energy modelers and programmers with many years of experience providing support, training, and software tools for EnergyPlus. We are part of the EnergyPlus Development Team. You can read more about our EnergyPlus work here. We teach you EnergyPlus from the ground up. We focus heavily on the syntax, relationships, and architecture of input objects–the building blocks of the text-based EnergyPlus input file. Whether you plan to work with OpenStudio, a commercial user interface, or just a text editor, the more you know about how EnergyPlus works at the text level, the more easily you will be able to unlock the power and flexibility of EnergyPlus. In fact, most user interfaces map very closely to the underlying EnergyPlus input objects. And as many modelers know from experience, the time inevitably comes when you need to move beyond the interface and work directly with the input file. Hands-on exercises are essential. Most of the real learning happens when you try to use the software yourself. Our workshops are approximately 50% lectures and 50% exercises. The step-by-step exercises begin to build the “muscle memory” that helps you to retain your new skills for long-term use. Mental models make it easier to learn. EnergyPlus encompasses a vast amount of stuff: input objects, input files, output files, documentation, software tools. Our workshops help you construct mental models to organize all of that information. Mental models provide structures, patterns, and best practices that bring order to the chaos. We are there for you after the workshop ends. Even after completing our workshop, sometimes you still need a little help…or a lot of help. We offer comprehensive EnergyPlus support services so that you can be assured that you will never be stuck for long. In this two-day workshop we focus on the needs of the energy modeling practitioner in order to get you up to speed and highly productive with EnergyPlus as quickly as possible. We cover the fundamentals of EnergyPlus such as geometry and internal loads while rapidly ramping up to advanced topics such as HVAC systems and controls. We guide you through the complexities of the EnergyPlus syntax, input/output files, documentation, and essential software tools including the Euclid extension for SketchUp. Most importantly, we teach you how to use the available resources to teach yourself going forward. Demonstrations and hands-on exercises are used extensively throughout. 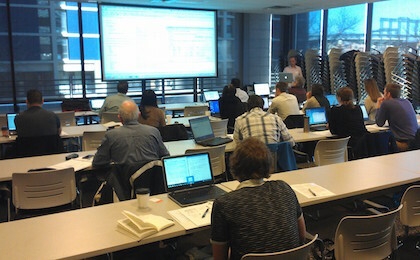 By the end of the workshop, you should be comfortable with creating, running, and debugging EnergyPlus models. Specific technologies or strategies (e.g., radiant heating and cooling, VRF systems, natural ventilation, etc.) that are anticipated to be critical for your upcoming projects. Software tools and techniques that we use ourselves to work more efficiently with EnergyPlus. Introduction to the full OpenStudio application and how to map EnergyPlus concepts to the OpenStudio interface. This one-day workshop covers the Energy Management System (EMS) capability of EnergyPlus, which allows implementation of custom control strategies and calculation routines that override standard modeling processes within EnergyPlus. We cover the EnergyPlus Runtime Language (Erl) that is used to describe the custom control programs, how to create EMS components (sensors, actuators, output variables, etc. ), and how to debug execution of EMS programs. Lecture topics include how to create advanced HVAC control sequences, how to override default HVAC operation (flow rate, setpoint temperature, capacity, etc. ), how to abort a simulation when operational faults occur, and how to use outputs to generate trend data. Demonstrations and hands-on exercises are used extensively throughout. Previous experience with EnergyPlus is recommended but not required. You are welcome to register for this workshop separately from the EnergyPlus for Practitioners workshop. This one-day workshop aims to quickly launch you into the world of the OpenStudio graphical user interface for EnergyPlus. We cover the major features and capabilities of the interface including creating and editing geometry using the full OpenStudio extension for SketchUp, managing space types and internal loads, and configuring HVAC systems and controls. (OpenStudio measure writing is not covered.) Demonstrations and hands-on exercises are used extensively throughout. Previous experience with EnergyPlus is recommended but not required. You are welcome to register for this workshop separately from other EnergyPlus and OpenStudio workshops. This one-day workshop covers advanced modeling topics related to the OpenStudio interface. We cover how to add custom library data (HVAC, building types, etc. ), model “bulk” air flow (infiltration, ventilation, inter-zone mixing, transfer air), configure layout and controls for advanced plant systems, use best practices for debugging energy models, and include thermal bridging effects in energy models. OpenStudio measure writing is not covered. Demonstrations and hands-on exercises are used extensively throughout. This one-day workshop focuses on teaching you how to write your own measures for OpenStudio’s powerful scripting and automation framework. We cover the essentials of the OpenStudio API, the Ruby programming language, and the OpenStudio Software Development Kit documentation. We explore all three categories of measures: OpenStudio, EnergyPlus, and Reporting. We will also show how to use a measure to automatically generate a baseline building model for ASHRAE Standard 90.1 compliance. Demonstrations and hands-on exercises are used extensively throughout. Previous Ruby scripting experience is not required. You are welcome to register for this workshop separately from other EnergyPlus and OpenStudio workshops. This five-day modular course is an excellent opportunity to deepen your DesignBuilder knowledge using features of version 5 of the software. The course is suitable for new and experienced users alike and is structured to give you plenty of worked examples so you can “learn by doing”. No experience with EnergyPlus is required. You can choose to attend any of the five days according to your particular training requirements. Please note that Days 2-5 all require previous experience with the 3-D Modeller or attendance on Day 1. This training will teach you how to use DesignBuilder to improve productivity, enabling you to model and analyse building performance using EnergyPlus much more quickly and efficiently. No prior learning or knowledge of DesignBuilder is required and the workshops will cover the key elements of modeling from early through to detailed project stages and LEED certification. Both days will use our latest software, due to be released in Fall 2017, which includes significant new ASHRAE 90.1 Appendix G automation, DAYSIM for LEED v4 daylighting credits, and a new online LEED reporting and submission tool. Free 30-day licenses will be provided, so why not come along and learn how to use these new tools and experience for yourself why so many customers say they would recommend DesignBuilder training to a friend or colleague. You can choose to attend one of the two days according to your particular training requirements. Please note that Day 2 requires previous experience using DesignBuilder or attendance on Day 1. Import models directly from Revit and from other BIM tools via gbXML import, and import floor plans to aid geometry creation. Quickly create and edit model geometry. Use DesignBuilder’s unique data input and management tools to vastly reduce your data input time and effort. Quickly model a variety of solar shading devices. Run steady-state heating and dynamic cooling load calculations using EnergyPlus’s accurate ASHRAE heat balance method. Run simulations and generate outputs to quantify comfort and energy performance. Set up an ASHRAE 90.1 proposed model “from scratch”. Gain LEED daylighting credits using new DAYSIM climate-based daylight modeling tools. Use DesignBuilder’s new LEED tools to automate the baseline building and HVAC system creation. Fine-tune and model non-predominant systems in mixed-use buildings. Data check and analyse outputs for LEED. Use the new online LEED reporting tools. What’s not covered by the DesignBuilder workshops? We do not cover use of the EnergyPlus software, modification of EnergyPlus IDF data, and Compact HVAC. Check out our EnergyPlus for Practitioners workshop for quickly getting up to speed on the fundamentals of the EnergyPlus engine.